Do you have an unmissable event coming up? Are you looking for a way to promote your services or new products? An eye-catching flyer can really help get the word out. Flyers can be easily created for your events, special promotions or about the services you offer. Leave a little stack of printed flyers on the counter at the local coffee shop for customers to pick up, or hand them out around the neighborhood. Give out flyers at festivals and outdoor markets. If the flyer includes a special discount or free item by showing the flyer at your shop or stall, you can improve the chances of your flyer not getting thrown in the bin! Don’t limit yourself to printed flyers, though. If you think about it, social media graphics that promote services and events, are essentially flyers too! You can easily send eye-catching flyers via email or by sharing on social media. 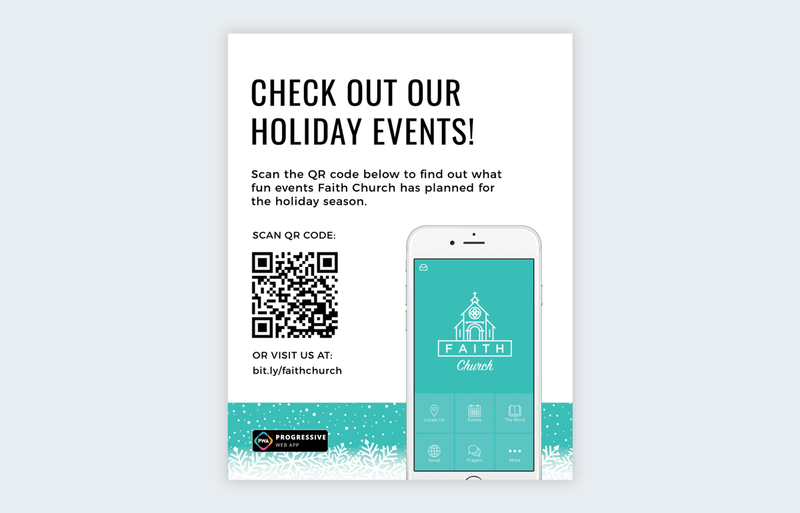 Create an even greater connection between print and web by including a QR Code. So, you’re not a designer? Don’t worry. Creating a good-looking flyer doesn’t have to be that complicated. Here at Visme, we’ve got lots of template flyers ready for you to customize and print. Much of the guesswork is already taken care of! 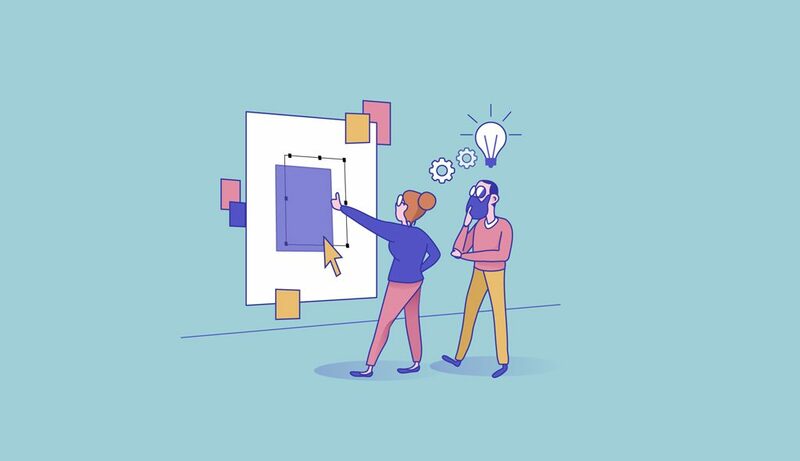 Regardless of the reason for creating a flyer, we suggest following some easy steps to get better results—and save tons of time. The one on the left is for a musical event at a lounge and the one on the right is for promoting the sale of a house. They are quite different to each other but both are quite eye-catching don’t you think? The vibrant colors and illustration of the flying macaw really catch your eye on the flyer for the musical event. The beautiful images on the house sale flyer call attention to the content and speak volumes on their own. 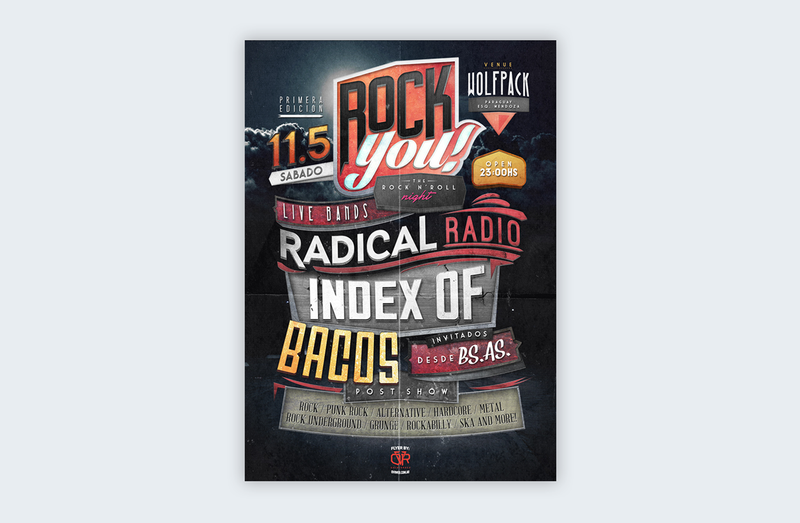 These are great flyer examples that you can get inspired by. When you are getting ready to design your awesome flyer, define its purpose first. A good way to start is to ask yourself, or your team, these questions. What is your flyer for exactly? Is the flyer meant to show general information about your business or is it for a specific event? Who exactly is the flyer meant for? Where and how will you distribute it once it’s designed? What size does your flyer need to be? When you've defined the exact purpose of your flyer, it’s time to organize the information in a way that will save you precious time when designing. It’s good practice to have all your information in a specific folder that holds all the things you need in one place. We always suggest that you organize everything in a cloud-based program as well as on your computer. 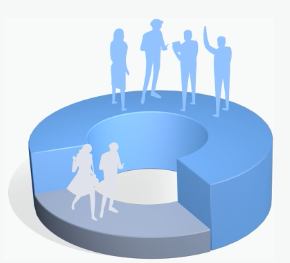 This is specially important if you are working with a team to create the flyer. Syncing a folder from your desktop to the cloud, to Dropbox or another program like Asana or Basecamp can really help. If you have a premium Visme account, you can organize all your information inside the editor with the help of the folders feature (one of my personal favorites). Create one general folder and name it with the title of the flyer, or any other name that you and your team will recognize easily. Each folder is meant to keep all the information organized so that when you are designing, you don’t waste time searching your desktop or the dreaded Downloads folder for what you need. Also, as you are designing and downloading, keep the drafts in the “drafts” folder just in case you need to go back a step in the process. According to the the type of flyer you will be designing, there are some points that you can’t forget to include. The amount of information you include in the flyer is up to you. 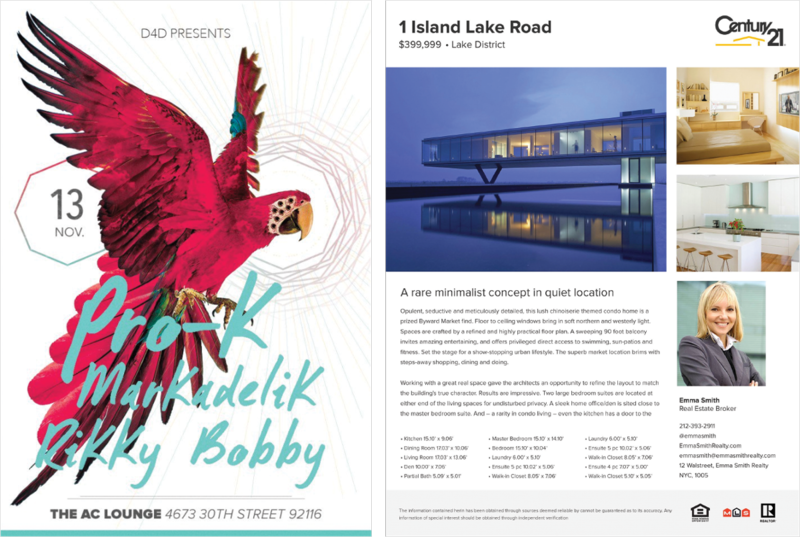 Below are two very different event flyers. The one of the left includes a lot of information while the one on the right is pretty minimalistic. 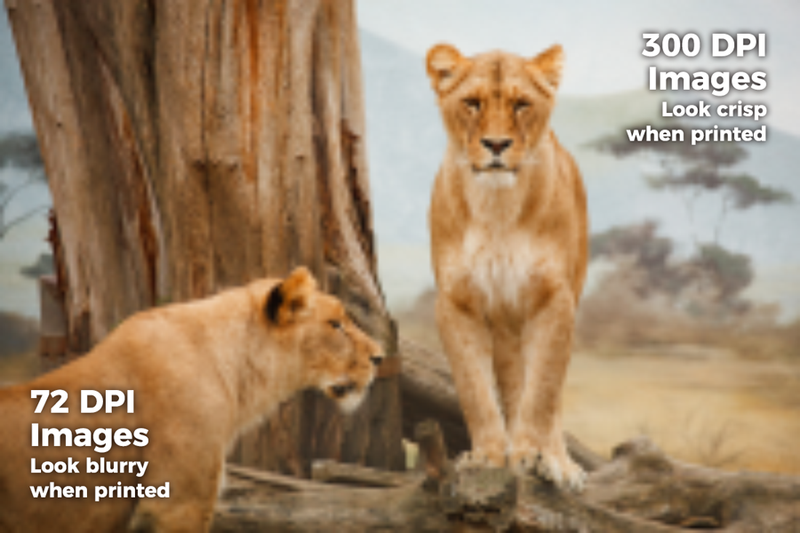 The same idea about amount of information applies for promotional flyers. How much information you include really depends on your brand and your message. For some, the flyer on the left might feel a little cluttered with too many capital letters. But in this case, it works because of the color block separations. Make sure that if you need to put a lot of information, you don’t reach a level of visual confusion. And if you can stay minimal, more power to you. Using a template can be really helpful and time saving, specially if you are not a designer. Believe it or not, some designers also use templates because they save so much time! Within Visme, you can either choose a fully designed template or open a blank canvas and use the provided blocks to build your own composition. 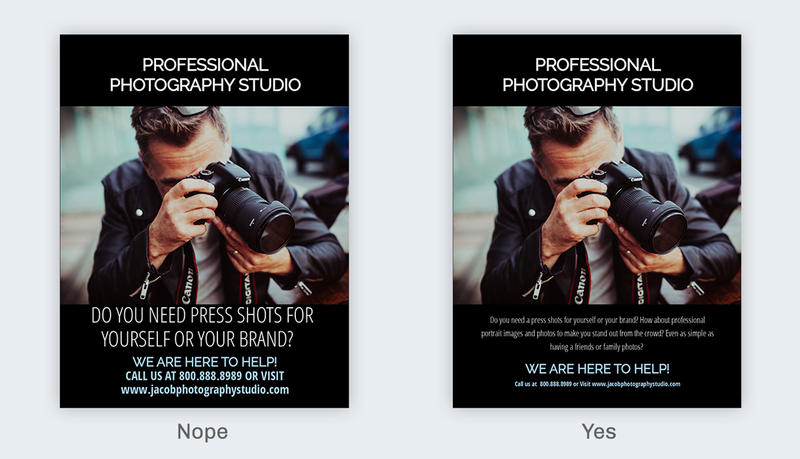 If you have a premium account, you can even save the finished templates for future flyers—a great way to stay on brand! Use your checklists and outlines to make sure you don’t forget anything when filling in the template. Nobody likes seeing a flyer with a section that says “insert your title here.” That would be a total facepalm moment, specially if you already printed a hundred of them! So always check and double check before really deciding it’s finished. 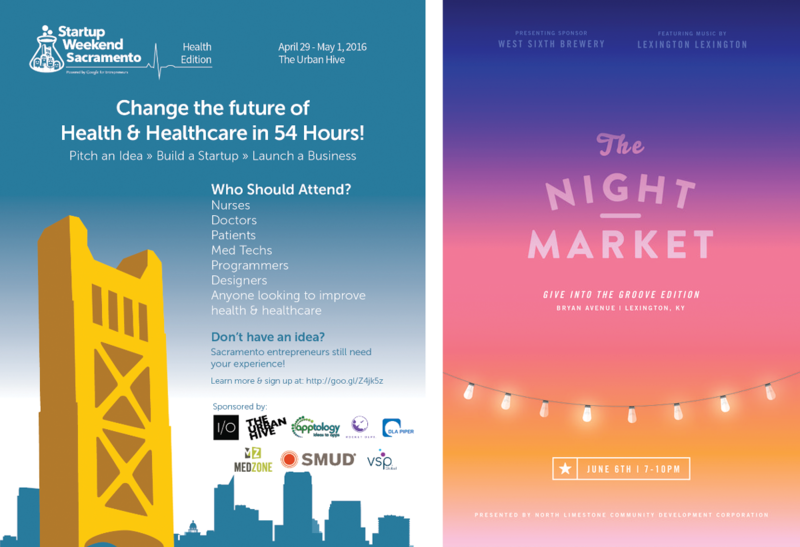 Open a flyer template in Visme (or your favorite graphics editor) that most closely matches what you need. 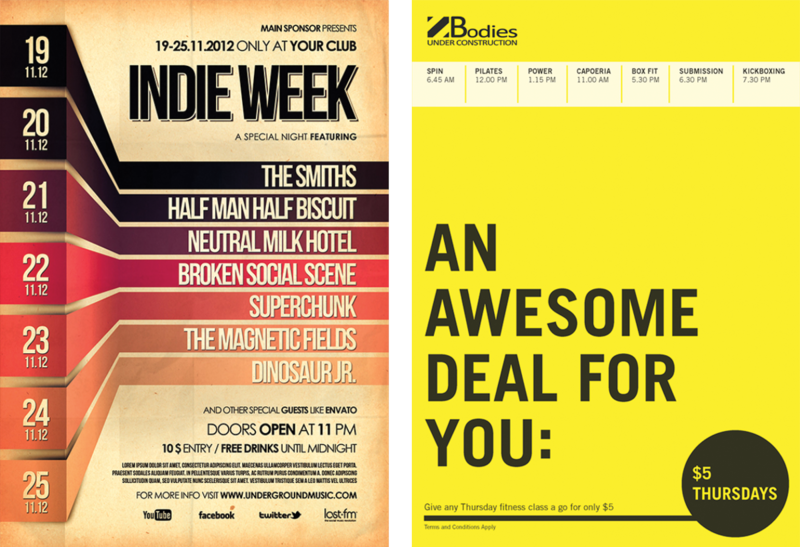 Visme has two sizes of flyer templates: 8.5 X 11 in. and 5 x 7 in. These are the standard flyer sizes but can be changed later if necessary. Fill in the information for your flyer in the template. If you have more, or less information than the template is set up for, just move the assets in the design so that your content fits better. The Visme editor lets you move everything around for easy customization. In the example below, I used the “Cupcake Sale” template and turned it into a flyer to promote a Pizza Sale. Here is a fast-motion video that gives a broad overview of how I changed the text and customized the design to meet my content needs. Add or change the visuals in the template. If you are using images from the provided gallery inside your editor, double check that the dpi is at least 300. If using your own images, also make sure the quality is high enough for printing. If you aren’t sure what this means, there is an explanation at the bottom of this guide. Remember to stay on brand. Use your brand style guide and change the colors in the template to your brand colors. Include your branding elements like backgrounds, visuals and shapes. Don’t forget your logo! If you need a different size, changing it is pretty simple. Just click on "canvas size" and enter the size you want. All the assets in the template will stay the same and you just have to adjust them to the new size. Proofread all the text and double check all the information. Do this twice. Ask someone on your team to look at it as well. Grammatical errors are the number one reason that flyers need to be reprinted! Save the design as a PDF with bleed marks. Below is a screenshot of how to do that in Visme. In the main dashboard, choose the “custom size” option and input your measurements. There is also an option to simply use a common size. From the left-hand menu in the Visme editor, choose text and image blocks to make your own composition. This tool is a real lifesaver when you can’t find a template you totally love. Using the folders that hold all your information, input all the text and copy into your design. Make sure to follow the checklist so that you don’t forget anything. Add the visuals to your design. Always use images that have a dpi of at least 300. Anything below and the images will look blurry when printed! If you have the premium version of Visme, staying on brand is really easy. Your Brand Kit holds all your colors, fonts and logos so that you don’t have to be second guessing yourself every time. Forget scrolling for the right font! Avoid clutter. Keep your design balanced. Think in terms of big and small or light and dark. If you aren’t sure, you can check our guide on how to create social media images. There are plenty of great tips there for avoiding clutter. 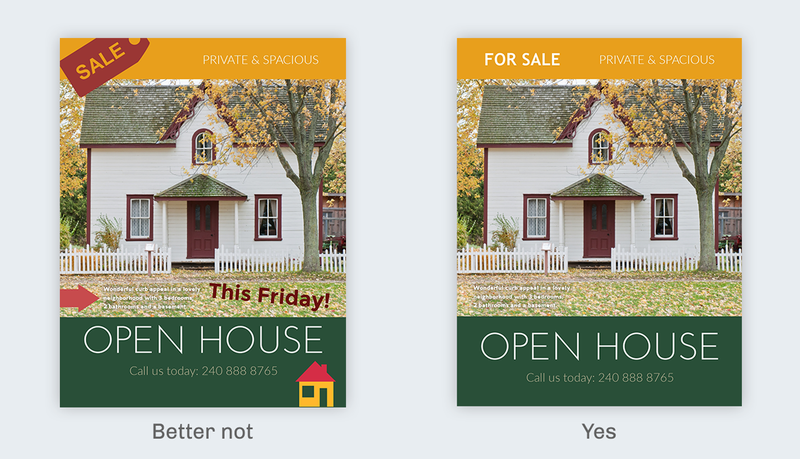 Browse and edit real estate flyer templates. Avoid complicated wording. Just keep the information simple and easy to grasp. Remember that people are usually skim text and skip to the important parts. Make it easy for them. Avoid using too much uppercase in your text. When there is excessive uppercase, it feels like you are yelling. Keep the big letters for titles or subtitles at most. Browse and edit photography flyer templates. Avoid using a photo without checking its resolution. There is nothing worse than printing a photo and it coming out blurry or pixelated. Browse and edit environmental flyer templates. Look at the flyer below. Even if it’s eye catching it’s also quite jarring don’t you think? There is too much going on and it’s hard to focus on one thing. 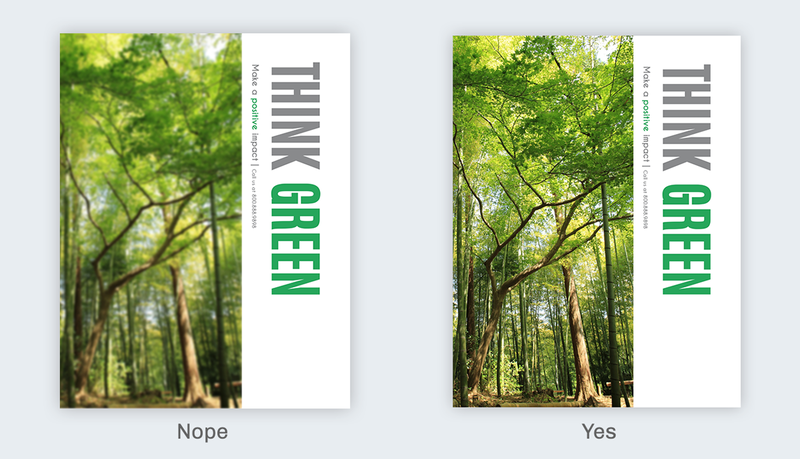 These are a couple technical things you need to know about designing for print. Knowing them will help your communication with the printers. All images have a specific resolution depending on what they will be used for. In digital, images tend to be smaller so that they load faster. There is a term that we call, “dots per inch,” or dpi. It basically counts the amount of pixels per inch inside an image. Digital visuals don’t need anything higher than 72 or 100 dpi to look ok. But for print, the dpi needs to be at least 300. When you use photos provided inside the Visme editor and then save as a PDF, the image will be instantly changed into the dpi you need for a crisp print. There are two color systems that designers use: RGB and CMYK. RGB is for digital and CMYK is for print. Printers will almost always ask for your files to be in CMYK so once you’ve downloaded it, just convert it here: pdf2cmyk.com. Some newer printing companies are not that picky about color systems because they can just convert it themselves, but best to send them the file in CMYK and save yourself some time. There are two options when printing your flyers. One would be to print them yourself with your laser printer. But why not send them to a professional printer when you have put so much work into the design? If you are sending out to a printer, talk to them before sending any files. If you followed the step-by-step guide we provided above, then your flyer will be perfect for sending to a printer. Talk to them about the kind of paper you want. Flyers usually come in a thin paper with a glossy finish. They will suggest the best option. We recommend you use recycled paper or at least 50% repurposed. Tell them the program you used to create the flyer. Inform them of the size, that you have it as a PDF with bleed marks, embedded fonts and that it has been converted to CMYK. 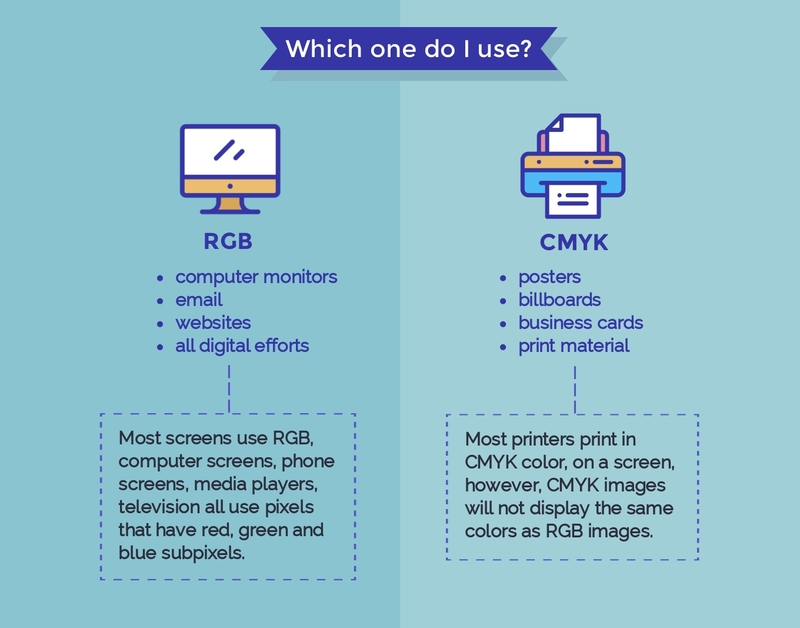 If you chose a different kind of paper than the regular flyer paper, ask them which CMYK system you need to convert the file to. They might just do that part themselves. Here are also some recommended online printing services. HI Marc, Thanks for reading our guide. I’ll go check out that other tut you mentioned on Flyer Devil. Hi Orana, this will help me promote or advertise my business. Thanks for sharing such type of article. Keep sharing! Glad to hear that! Did you use our checklist when creating your content?